I love the look of background text. I think it lends an air of romance to a card. Here's a card I made using a background text stamp in Versamark on kraft. Unfortunately, the text stamp is an unmounted rubber stamp I picked up somewhere along the line and never thought to label with the maker's name. Oops. Another lesson learned. I stamped the jar and flowers (from PaperTrey's Friendship Jar and Friendship Jar Summer Fillers) with Versamark and embossed with white embossing powder. I detailed the jar with W2 Copic, then colored in the leaves and flowers with Copic markers (sorry, I forgot to note the colors I used). The mat under the sentiment is cut with Papertrey's Half and Half die, then stamped in Summer Sunrise. I drew the orange stripes using a ruler and a Copic marker. 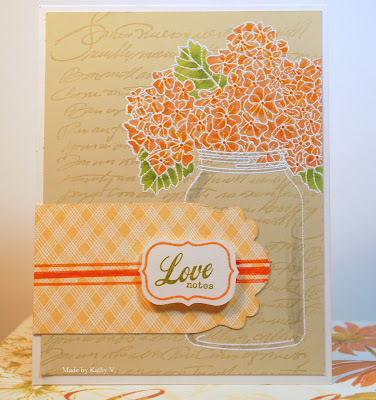 The sentiment was stamped on white cardstock, then cut with the Jar Label die from PTI. I then adhered the finished piece to a cream card base with pop dots. Makes a nice love note for Fall, don't you think? Sorry about the funky lighting in this photo. I'm still trying to get that right! What do they say? Oh yeah, practice makes perfect. Looks like a little more practice is in order. Thanks for stopping by. Get out and try something creative today!